Places to visit in the Huertgen Forest? Cahow's and Dempfle memorials, and destroyed pillboxes in the area near the Raffelsbrand Junction. Park your car here: Link to Google Maps cross the road and follow hiking path #8. Photos of the cemetery can be found here on my website. Read the personal account of Henri Kalinowsky here. A must see in Vossenack is the Museum - Huertgenwald 1944 and in peacetime. Check this website http://www.museum-huertgenwald.de for opening hours. Mestrenger Mill and Kall Trail. One can drive with the car to Mestrenger Mill and take a short hike on the Kall Trail (Vossenack side and Kommerscheidt side). Drive with the car towards this point: Link to Google Maps arriving from Vossenack, turn right and follow the trail, at the junction of trails, keep left, then straight ahead towards the parking lot of Mestrenger Mill. About 20 meters back towards Mestrenger Mill, on the slope on the right side you will find the aid station dug-out. Cross the bridge and turn left following the zig zag trail towards the red tiled weekend home. Here you will find the German tank track embedded in the road. Photos of the Kall Trail and Mestrenger Mill can be viewed here on my website. The beautiful look-out point, overlooking the Schwammenauel Reservoir, at Schmidt. Also a must see is the look-out tower on top of Hill 400 (Burgberg in German) located at Bergstein. Hill 400 was stormed by the 2nd Rangers Battalion on December 7, 1944. A video about Hill 400 can be watched here on my website. A hike on top of the dragons teeth at Bickerath, park your car here Link to Google Maps and follow the sign Westwall Wanderweg. A visit to Der Buhlert woods with its four not demolished pillboxes (takes half a day). Places to stay in the Huertgen Forest? 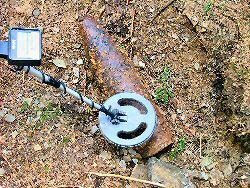 In the Huertgen Forest, the use of a metal detector is forbidden by law.